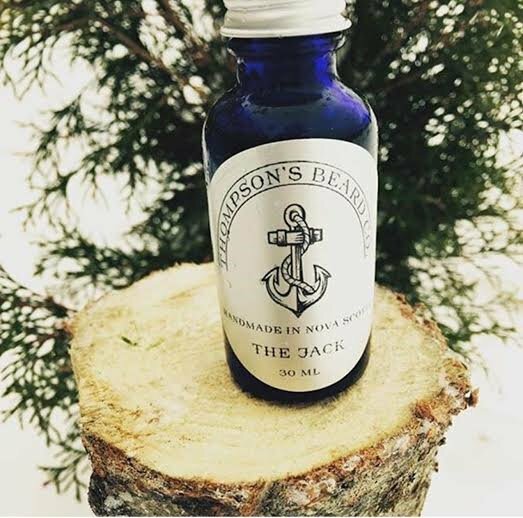 I have been using a woodsy fresh smelling beard oil for the past few days, its Thompson’s Beard Co ‘The Jack’ Beard Oil. Thompson’s Beard Company is owned by James Thompson who lives in Nova Scotia, now for me living just east of London, when I imagine Nova Scotia I think of wild coastlines, untouched landscape and bearded men living off the land, I guess I might be way off but we all have ideas of what these different places are like, James might think we sit round having afternoon tea lol. So far I have been very impressed with the beard care products from Canada and ‘The Jack’ from Thompson’s beard Co hasn’t changed that opinion. A beard oil that has a base of Grapeseed, Sweet Almond, Jojoba, Avocado and Vitamin E carrier oils into which a very well balanced blend of Cedarwood, pine, birch and eucalyptus essential oils is added. Eucalyptus oil has the potential to be quite overpowering, with a strong woody and sweet smell but it sits perfectly in this oil and my dislike for Cedarwood isn’t a problem as the oils are so perfectly balanced. A warm, sweet and woodsy beard oil that gives a good hold to your beard and leaves it looking and feeling good. When you hear Nova Scotia, you probably think about Keith’s India Pale Ale and fishing boats. You can keep thinking about those but I also want you to consider beards. Specifically the products you can use to enhance yours and those around you. We set out to create a line of men’s products that would cater to any gent with some sort of facial hair. We get that it’s not the size of your beard that counts but it’s the quality of the product you put in it and it’s because of that we felt the necessity to create a superior product. You owe it to yourself so treat your beard with the utmost respect and you’ll be surprised with how your beard treats you back. Lone Wolf – Amyris, Patchouli, Lavender and Sandalwood. The Boss – cinnamon, clove and tea tree. Berserker – Birch Tar, Benzoin, Rosewood and Sandalwood. I am now testing Thompson Beard Co ‘The Boss’ Beard Oil and the review will follow soon! ← Me, my beard and everyone’s opinion!